MotoGP championship leader Valentino Rossi will start the final race of the season from the back of the grid after knocking Marc Marquez off his bike during the Malaysian Grand Prix. Rossi finished third but was given three penalty points following a post-race investigation. He later accused Marquez of "making me lose the championship". Honda's Dani Pedrosa won the race, with Jorge Lorenzo second. The final race takes place in Spain on 8 November. Rossi now leads Lorenzo by just seven points in the championship. The Italian said Spain's Marquez "rode only to cause me problems". Yamaha appealed against the decision on Sunday, but that was rejected by race stewards. 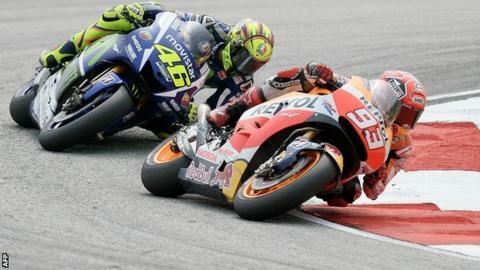 The incident happened on lap 13 of 20 after Rossi had gestured at Marquez following an overtaking move. "Unfortunately, I lose a lot of time with Marc," the Italian explained. "And in turn 14, I tried to go a bit wide to take a better line and make him slow. "He came to me and I think he crashed in that moment. His handlebar touched my foot and my foot slipped off, a bike can't crash only with a touch. "He has won his fight, he made me lose the championship." But Spaniard Lorenzo had called for Rossi to be punished, adding: "It's clear that he took Marquez off." Before the race Rossi, 36, accused Marquez of deliberately trying to impede him during the Australian Grand Prix on 18 October in order to help Lorenzo. "Marquez did not play with both of us, he played only with me," Rossi said. "He isn't playing fair. He would prefer Lorenzo to win. He is angry at me for a personal matter." MotoGP race director Mike Webb said: "It's irresponsible riding causing a crash and for that we have imposed three penalties points on Rossi." Rossi's lead means he will definitely win the title if he can finish in the top two in Malaysia, while Lorenzo must finish at least eighth to have any chance of depriving him. Rossi is seeking his seventh MotoGP title, while 28-year-old Lorenzo is trying to win his third.